Buy online 200 sq. ft. 4 ft. X 50 ft. x 1/8 in. Cork Underlayment Roll for Ceramic Tile, Stone, Marble and Engineered Hardwood 72008Q and leave review or share with Your friends. 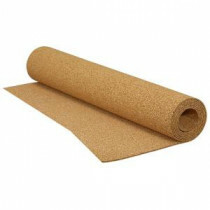 QEP's Natural Cork Underlayment is now available in 1/8 inch thickness in a convenient 200 sq. ft. roll. Natural cork is the environmentally friendly underlayment choice for many types of flooring, including: ceramic and porcelain tile, stone, marble and engineered hardwood and laminate floors. Besides being an environmentally friendly option, cork is also a healthy choice. It is naturally hypoallergenic and contributes in creating healthy indoor air quality. Install like a professional by using Roberts 7250 Cork Adhesive.